I picked up these chairs from a fellow freecycler, saved them from their date with destiny in a landfill. 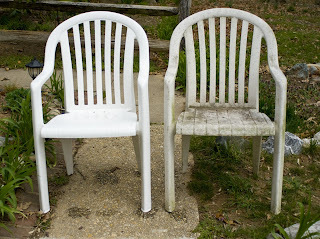 After 2 hours of determination and elbow grease, both chairs are sparkling clean and ready for our next backyard BBQ. I need to know what you cleaned the chair with because they look wonderful.